I warned him. And I reminded him as we went our separate ways before taking in the Todos Santos events of Dias de las Muertos, but somehow he forgot. Or let’s just say there was a communication breakdown. You see Sacha had some problems with his OxStar (sp?) motorcycle boots. The straps for the buckles were falling apart and the tips of the soles were warn a bit more than one would like; perhaps from dragging his feet on the ground while riding those long and fast straightaways. The shoe repair place just a few blocks east of the zocolo made special amends to have his boots ready today. But because this is the big festival and much a holiday in Oaxaca, the place closed early. And tomorrow (November 2nd) is the official holiday and they are closed. This means another day in Oaxaca. I joked about leaving him behind. Maybe I should. But no. Not now; not yet. To say that Sacha was a bit frosted would be an understatement. Me? I am eager to get to Chiapas, and I regret not going with my gut instincts to visit the Pacific Coast surf resort of Puerto Escondido prior to getting to Oaxaca. But J.J. with his waning visa and Sacha with his confidence that we’d see “plenty of beaches” once we get to Central America, I was outnumbered. But it made more sense to spend two days in P.E. and then a couple days in Oaxaca. Instead, it’s looking like 5 days in Oaxaca. But Thursday morning we made an early start and headed to Chiapas for San Cristobal de Las Casas. It’d be nearly impossible to make this journey in a day, so our plan was to ride until just before dark. Leaving Oaxaca was a breeze. The smooth road through agave plantations with soft sweeping curves was a joy. Relaxed and enjoying the cruise, I plugged my Westone custom earmolds into my iPod Shuffle and with a random playlist cruised to the beat of great music. And not that I have to plug any of my sponsors, I must give a thumbs up to Westone for the best quality earmolds and likely the best sound for listening to music while riding a motorcycle. Sure, you must be prudent and not crank it up too loud. It’s important to hear and feel your engine, sounds of other cars and trucks and to be totally cognizant of your surroundings. But there’s nothing like riding with good music. Both J.J. and Sacha had custom earmold earphones made prior to heading out on their respective journeys. Both were damaged when just a slight tug caused the wires to get yanked out of the earmolds. I’m not sure who made their earmolds, but with my Westone, I’ve never had such a problem — and I’ve had several tugs forgetting that I was tethered to my bike when hopping off. Never have they pulled out of the molds. Sure, they cost a bit more, but unlike J.J. and Sacha, I have not had a single problem. But beyond the great road, good music the ride out of Oaxaca took us past the mezcal capital of the world. Mezcal is not unlike tequila, manufactured from the “agave mezcal”, it tastes a bit stronger than its close cousin and many producers use it to create essence liquors with extract of banana, coffee and other fruits. Or, it is simply sold pure as tequila. My taste buds handle a good tequila, but I havn’t really found a mezcal that suits my palate. Sacha on the other hand warmed up to it immediately. But who can resist a quick stop to watch the process of making this desert nectar? I spotted a small smoking fire and two gentlemen whacking agave with large axes. It’s mezcal in the making. There are three primary differences between Tequila and Mezcal. Technically, teguila is a mezcal. It’s the plant and the production process that distringuishes the two. Both are derived from agave (which is NOT a cactus) and come from plants grown in the arid highlands of Mexico. First, Tequila comes from a single species of blue agave called tequilana Weber. 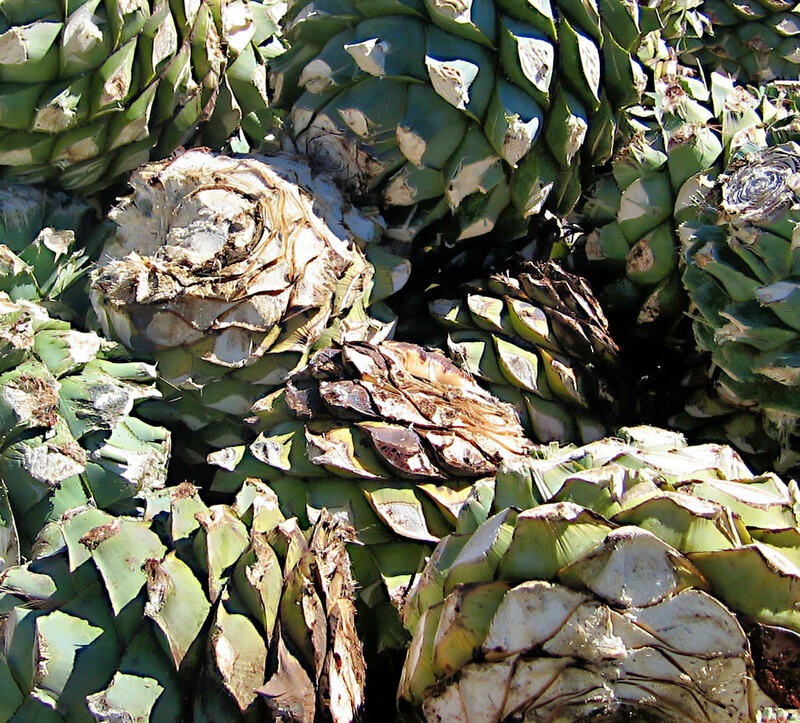 Mezcal can be produced from any of 5 species of agave. Second, tequila is distilled twice and mezcal only once. Finally, mezcal piñas – the sugar-rich heart of the agave – are baked in a conical, rock-lined pit oven (palenque) over charcoal, and covered with layers of palm-fiber mats and earth, giving mezcal a strong, smoky flavour. 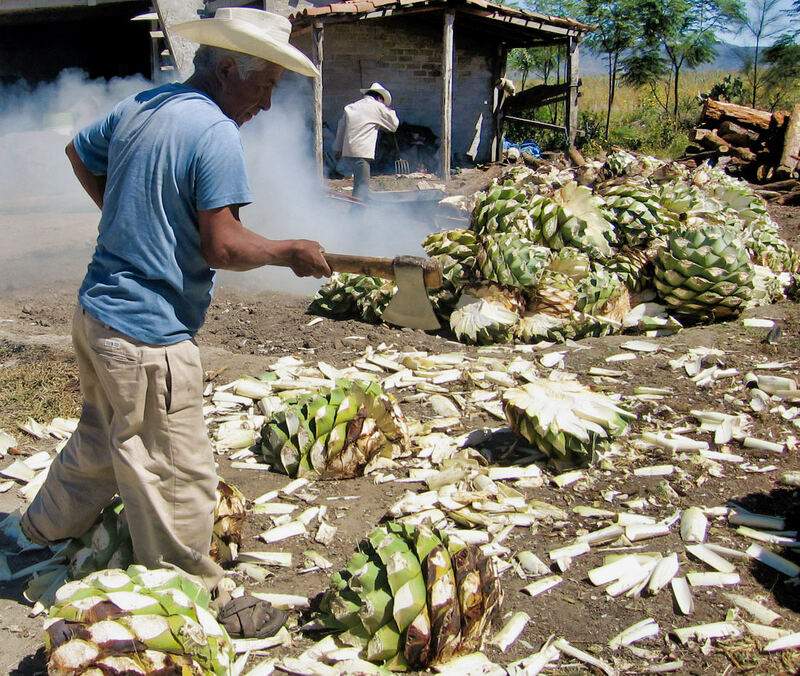 Tequila piñas are baked or steamed in above-ground ovens or autoclaves. It takes 7-10 years for an agave plant to mature. Winding through the high desert of Oaxaca state we pass hundreds of blue agave plants lining the road, climbing the hills and streteching to the horizon. With the sun shining bright behind us, the blues of these plants light up like fluourescent black lights. Yet, soon the agave and arid highlands disappear as we wind down toward the isthmus of Mexico. 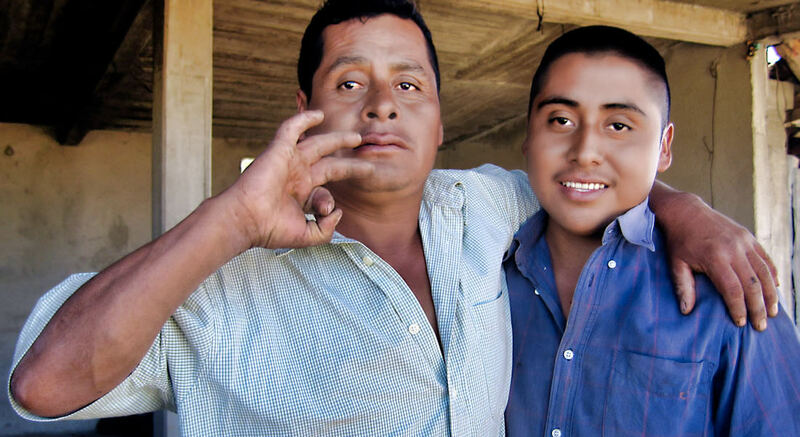 Called the Istmo De Tehuantepec, it’s narrowest point of Mexico where only a couple hundred miles of foliaged deprived lowlands separate the Atlantic and Pacific Oceans,. Sacha pulled over to take a nap. He decided to take in the nightlife a bit later than I last night and the last cup of coffee just wasn’t keeping him awake. I ride on and head toward La Ventosa. The stretch of highway here is extremely windy, perhaps close the 100 mph winds that have made Ruta 40 in Patagonia so famous. I have to lean the bike at a near 45 degree angle to keep upright. Heavy gusts throw me across the two lanes. And at an intersection one of two metal posts holding the sign has been ripped out of the ground and the sign folded in half. I have to stop to read the sign, but getting off my bike is a risky proposition as it starts to fall over. I straddle the beast and wave a car down as it pulls onto the interchange. Once agross the Isthmus I feel like I’m in a different country. The arid highlands and barren lowlands are gone as the tropical foliage consumes the roadsides. I feel as if I’m riding through a tunnel with 6-10 foot high vegitation obscrures my view to anything but the road. I’m need gas. The reserve fuel warning light is glaring at me. Soon I see what is surely a result from Hurricane Stan. A low stretch of highway with severe water damage is being repaved. And elsehwere a half of a bridge is out. Single line of traffic lines up. Taking turns. I zoom to the front of the line. The fuel light still glares at me. The sun lies painfully low on the horizon behind me. Still no sign of Sacha. Earlier, I had waited 30 minutes to see if he’d catch up.. But now fearing that I’d run out of gas and with the sun hanging painfully low, I pull over at a small community. A local points across the street to a small store. “Hay gasolina aquí” I didn’t like the look of the place, so rather than brave the chance of expensive and poor quality fuel, I pulled one of my reserve 1.5L bottles out of my tank panniers and refuled. This would get me 20 miles or so. In about 20 miles I find my haven: a PEMEX station, and just beyond, a hotel. Within 5 minutes of checking out the accomodations Sacha pulls into the hotel. We’re in Zanatapec, still 5 hours from San Cristobal de las Casas. Photos: (1) workers chop the Agave plant stripping the long leaves and leaving the heart, the key to great mezcal; (2) hearts ready to be burned to raise sugar levels prior to fermentation; (3) the owner of the mezcal production facility and his son; (4) beautiful blue agave plantation.